The VS0110HA 4K HDMI Splitter is a perfect solution for applications that require sending one source of high-definition 4K video to ten displays at the same time. The HDMI interface caters to most mainstream sources and sinks, such as DVD players, satellite set-top boxes, and any HDMI displays. Featuring ATEN EDID technology, the VS0110HA guarantees continuous EDID communication with connected devices and maintains optimum video outputs. 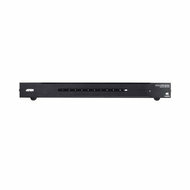 The VS0110HA 4K HDMI Splitter is HDCP (High-bandwidth Digital Content Protection) compliant, making it effective for use with all HDMI displays in home theater applications, as well as in corporate, educational and commercial settings.